Located at the gateway to the Northeast of Hanoi Capital, 6.5 km from Hoan Kiem Lake, 5.5 km from Chuong Duong bridge, close to Vinh Tuy bridge and flexible connection to important architectural ensembles of the capital by modern system of roadway, elevated highway, Vinhomes Riverside is high-class ecological urban area which is designed in accordance with the model of Venice city (Italy) - a glamorous and opulent city. 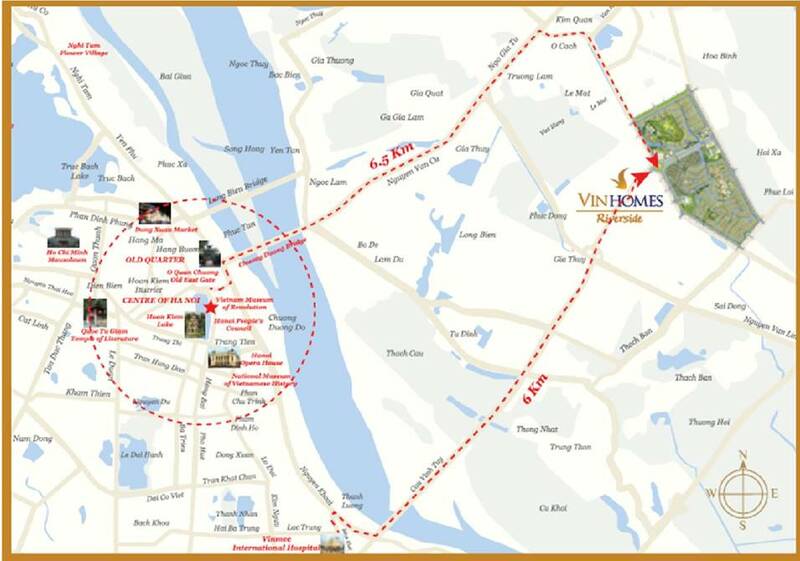 Vinhomes Riverside is located right in the centre of Long Bien district intersected boundaries of 3 wards including Viet Hung, Phuc Loi and Giang Bien. The project is very close to Vinh Tuy bridge where is convenient for residents to travel towards the city center. With the aim of building a luxury resort right in the city capital, Vinhomes Riverside is invested to provide modern infrastructure, fresh and tranquil environment in harmony with nature and exclusive facilities and services. All daily needs of residents and families are met at maximum level. Construction density is low, with an area of over 180 hectares, the investor has allocated 60 hectares for park, greeneries and water; 50 hectares for transport infrastructure. Green density is up to about 60-70 m2 / person. With canal system, biodiversity garden and modern public utilities, Vinhomes Riverside brings residents a perfect and convenient life; as well as creates different point to make Vinhomes Riverside become one of the first urban in Vietnam that can be on par with high-ranking urban center in the world.